I must have been to Nepal a dozen times without ever making the trip to Lumbini, the birthplace of Buddha Gautama. This winter finally a visit materialised. Never having been to any of the important pilgrimage sites that Tibetans usually visit, I was hugely excited with anticipation, hoping to find fresh inspiration for my Dharma practice. We rose at dawn to avoid the crowds and made our way on foot through the lovely park covered in mist. The place was simple and serene. I couldn’t believe how modest and low-key the whole site appeared. While my idea of Buddha was so grand, the place of his birth appeared so modest. If the Buddha were born in China the place would be a glaring, overcrowded circus with exorbitant entrance tickets and all kinds of unrelated plastic souvenirs on sale everywhere. Fortunately Lumbini was the pure contrary: No sign of commerce, an oasis of calm and tranquility, a peaceful garden inviting visitors to remain for a while and reflect. There we were in front of a simple white structure: The temple erected for the Buddha’s mother, Queen Maya Devi, on the spot where she gave birth. We removed our shoes and walked through the security gate. The guards checking our bags asked where we were from. We've been taken for all kinds of nationalities when travelling in Asia: Korean, Thai, Japanese. Heaven knows what they thought we were but they smiled when we answered, "Tibet" - always the spontaneous, non-rehearsed answer to this question. You can take the person out of Tibet but you can't take Tibet out of the person. Photographs inside the temple were not allowed. A Newari Pola offered Tibetan-style, full-body prostrations along the circuit leading to a wall of rock at the centre of the building. The rock is said to display the contours of the Queen giving birth under the tree. We touched it with our foreheads and remained in silence for a moment. Then the children offered Khatas and bank notes and we remained for a while. In contrast to the holy sites in Tibet such as the Jokhang in Lhasa, there was no shoving and pushing. There were no over-zealous monks on duty controlling the streams of pilgrims. Then we continued to the pond behind the temple where the Queen Mother is said to have taken baths. Next to the temple was the historically important pillar erected by the Indian ruler Ashoka. I learned that Lumbini was "discovered" in the 19th century due to the inscription on this pillar and the travel accounts of the Chinese pilgrim Faxian. Unfortunately there was no chance to catch a glimpse of the inscription as a large group of Singaporean pilgrims circumambulated the pillar which was fenced off. What does the inscription say? I'm still trying to find out. I only know it is said to be in Brahmi, the first written language of India used during Ashoka's reign in the third century BC. As the hours went by more people started to poor into the complex. Besides the large group of Thais and Singaporeans, there was also a delegation of Chinese monks in grey robes, Korean believers, Newaris from the Kathmandu Valley and a lot of Indians where I couldn’t figure out whether they were pilgrims or tourists. The contours of the Queen Mother at the rock inside the temple remained hidden to my eyes. I couldn't get close enough to catch a glimpse of the inscription on Ashoka's pillar either. 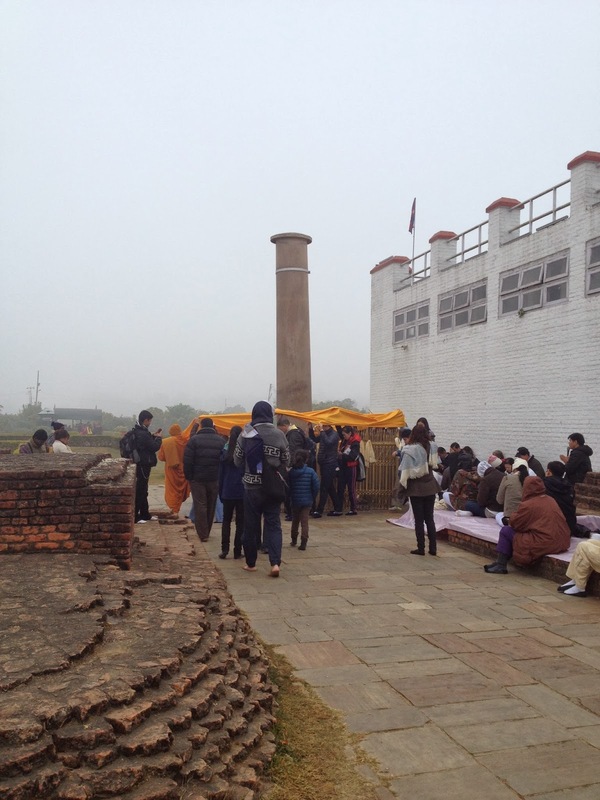 The rock and the pillar are the two main sanctuaries of Lumbini. Still I walked away delighted and refreshed because I was able to derive a sense of serenity from the surroundings and for the first time, the deified Tibetan Buddha felt human. He felt so close that for a moment enlightenment appeared reachable. Coming out of the Tibetan tradition I am so used to think of the Buddha as a transcendental figure in a sea of other Buddhas, Bodhisattvas and deities. Everything that is associated with Buddha in my mind automatically had to be golden, shiny, colourful with lots of décor, brocade hanging from the ceilings, fragrant flowers and water bowl offerings everywhere - not to mention altars overloaded with mountains of fruits, whole armies of bottled Coke and other soft drinks carefully arranged before piles of biscuits - only the best of everything and in ample abundance. And enlightenment? It is understood as something so high and difficult that it's almost arrogant for someone to be thinking about it loud. It was a bit sad to see that of all the Mahayana monasteries in Lumbini, none said "Tibet" - but then several of the listed monasteries practice according to the Tibetan tradition. 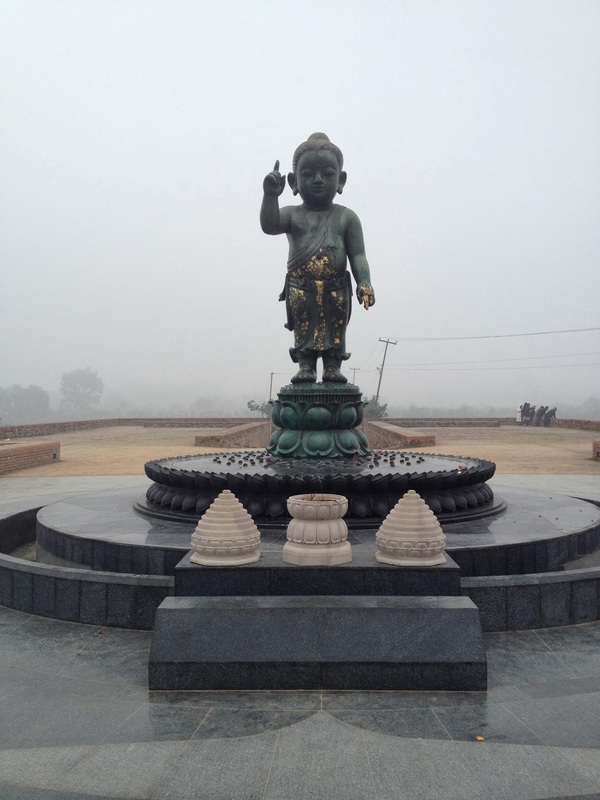 The physical encounter with Lumbini also spurred an interest in the person of the Buddha and early Buddhism: When exactly again was Siddharta Gautama born? Who were his first disciples and how did he go about growing his Sangha? Which were the main political events in his time? How long after Buddha did Ashoka appear and what exactly was it he did that helped establish Buddhism? How did the Buddha’s teaching differ from the other creeds in the area? Why did Buddhism disappear in its homeland but was successfully exported to other countries? Where are all the Shakya people who lived in the Lumbini area? Were they Newaris like the Shakya in the Kathmandu valley? Was the Buddha a Newar? Approaching Lumbini overland shows the place is located in a sea of ethnically Indian Hindus. Buddhism is non-existent. What happened to the history of this place? Loads of questions to which Tibetans usually don't get exposed. Our texts, the translated words of Buddha Gautama bka'gyur and the commentaries bstangyur, are intended to convince readers of his message, not to give historically accurate information. To begin with, we have so much respect, there is no need for historicity. We don't ask for proof because we believe in all seriousness and from the heart. Preaching to the converted is a waste of time. But I suddenly felt a need to know more. 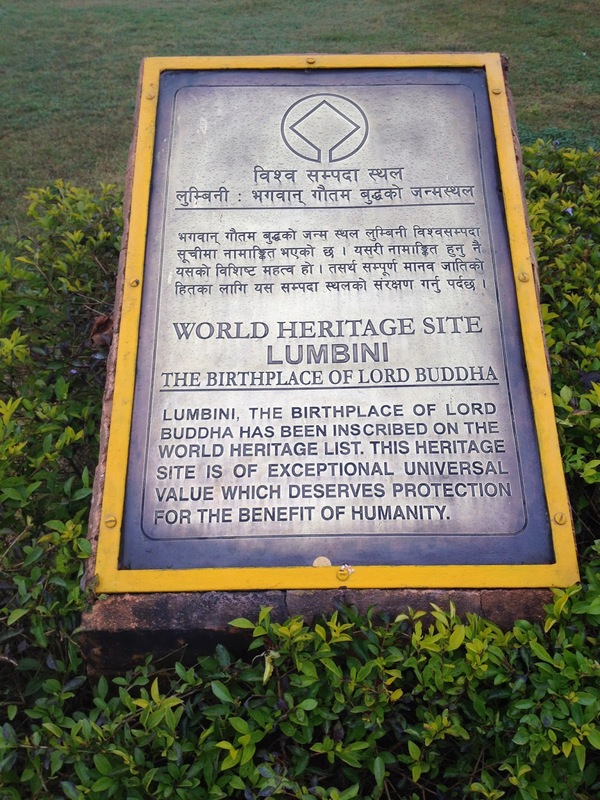 Lumbini made me rediscover Buddhist history. Only weeks before our departure to Nepal the BBC carried a story about a new archaeological discovery in Lumbini saying right underneath the Queen Maya Devi temple, they discovered the remnants of an ancient, possibly Buddhist shrine dating to the 6th century B. C. implying we would have to predate the Buddha's birthdate from approximately 484 B. C. to the 6th century B. C. At once critics challenged the claim some going as far as doubting the authenticity of Lumbini itself as the place of Buddha's birth. A son gives his old mother a dogtooth solemnly telling her it is a tooth of the Buddha. The old mother worships it with great devotion until one day the dogtooth displays ringsel - tiny white, pearl-like stones that were found in the ashes after the Buddha's body was cremated. They are considered sacred with the power to bless and heal. 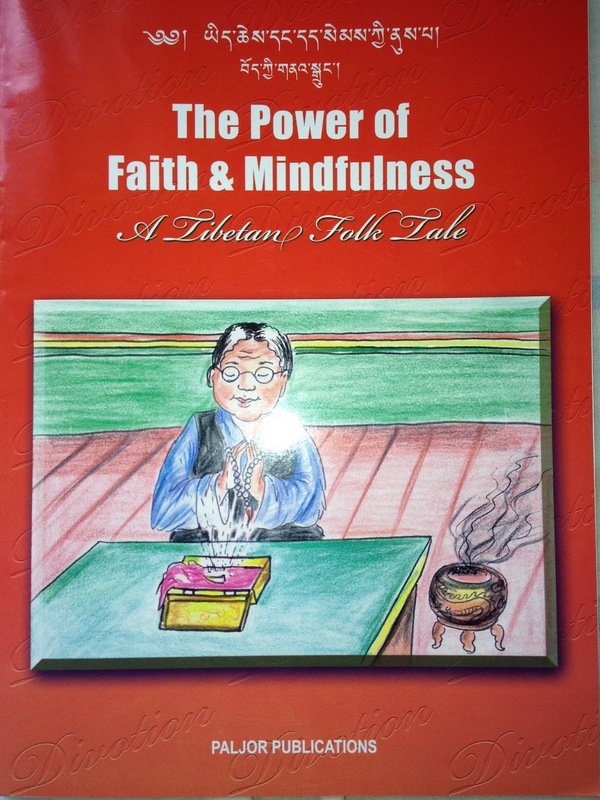 Through the example of the old mother, Tibetan children learn about the importance of a pure heart and clean motivation. The accuracy of the object is secondary. Maybe then historical accuracy with respect to Buddhist excavations and discoveries was not that important at all? Once I heard the Lama say there are two kinds of practitioners: Those with strong intellectual faculties who practice by mainly following wisdom and those with weaker faculties who practice by mainly relying on faith. Both paths, he pointed out, can lead to the goal if practiced with the correct motivation. In my case faith is weak and whatever wisdom I have tends to create doubt. Motivation, moreover, often becomes diffuse along the way. I realise I am not firmly grounded in the Dharma: Depending on whether historical findings confirm or contradict the transmission, I get confused. Sometimes I am almost waiting for an encouragement from science to bolster my faith. But after Lumbini I have also become aware that historical research has its limits and that I cannot expect historicity or science to step in for my lack of faith. History cannot always back up the transmission. It is when the two don't converge that I must come out and make my own decisions based on wisdom from previous experience, a pure motivation and – yes, faith. In a way Lumbini is a strange place. It's history interrupted and there are so many questions. But it also brought the Buddha home to me. In Lumbini I was able to see him as a “fellow human being” hopefully making it easier to emulate his deeds.